In our previous post, we wrote about the new Tecno HiOS, which is the latest Tecno user interface and premises lots of mouth watering features, however during the cause of the week, Tecno released a beta build of its upcoming new user interface HiOS, to the Camon C8. The beta version which can be downloaded from Tecno’s new Spot forums has been available to Tecno’s online community of users and enthusiasts for the last several hours complete with instructions on how you can manually upgrade your Camon C8 with HiOS of the beta build version . Dont worry yourself much about its size, as it is just around 40mb. Where Can I Download The Camon C8 HiOS Beta? 1. Please ensure there is sufficient power for SD card upgrade (30% battery or greater). 3. If upgrade is interrupted, please re download package and try again. 1. Download and Unzip OTA differential package for the files shown in the picture. 2. Place update.zip into SD Card root. 3. Insert SD card into mobile T-card slot. 4. With mobile powered off, hold power and volume-up buttons at the same time until startup animation appears. 5. Android and warning label appears. 6. Hold power button alone for 2 seconds then press volume-up without releasing the power button key to enter the following interface. 7. 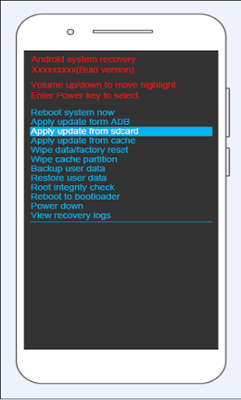 Press volume-down key to select “apply update from SD card”. 8. Press power button to enter the following interface, then press volume-down key to select “Tcard_update.zip”. 9. Press power button to confirm selection for the following interface. 10. Interface automatically changes after process is complete; default selection is set to “reboot system now”, as show in the picture. 11. Press power button to restart and initiate OS. 12. Select “Settings” and then “About Phone”. A change in version number indicates the upgrade was successfully completed. You can check for more information regarding the source Tecno community link below, however we will update this post with live images as time goes on.